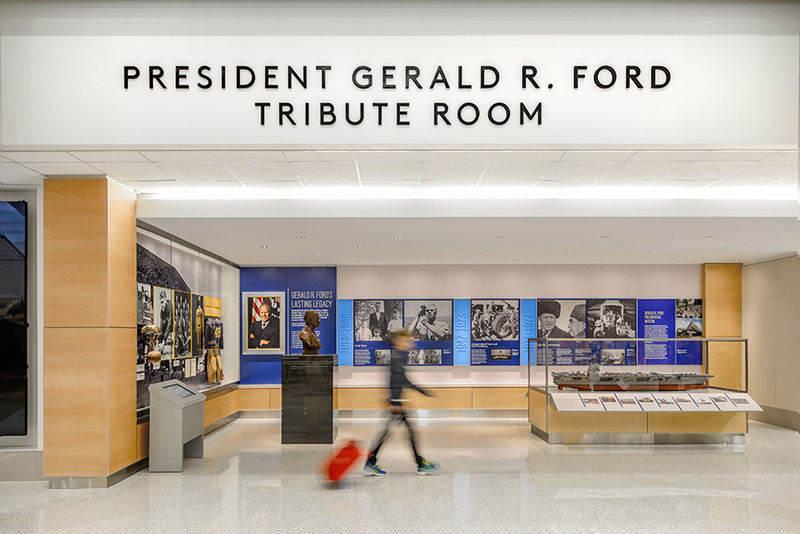 Alliiance designed a concourse and terminal expansion and renovation for the Gerald R. Ford International Airport dubbed the Gateway Transformation Phase 1. TThe concourse project provides additional gate hold space, new concession areas, and new finishes. Skylights provide welcome daylight to the center of the concourse and a new food court. At the heart of the terminal expansion project is a consolidated security checkpoint and a marketplace with access from both of the airport’s concourses. 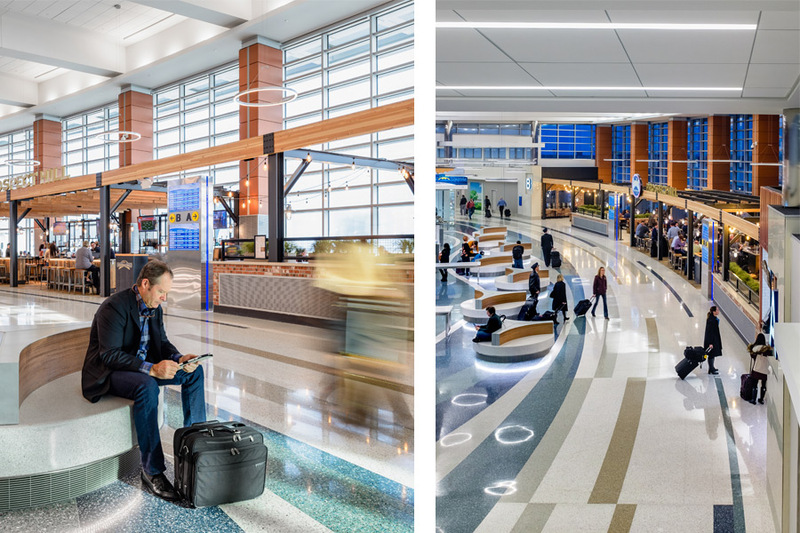 This spacious light-filled atrium is a grand civic space that takes advantage of and celebrates, airside vistas and the region. 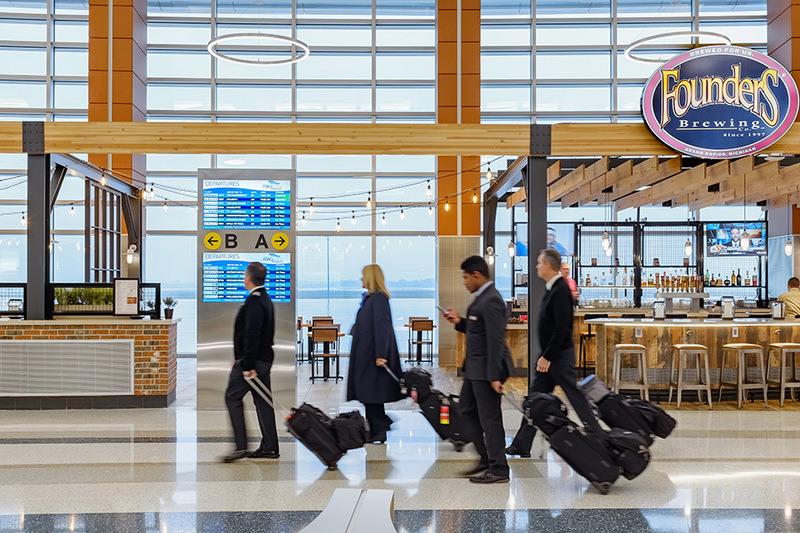 A full-service restaurant, prominently located retail venues, relaxed passenger seating areas, state-of-the-art restrooms, and spacious new concourse links are project hallmarks. Both projects feature design inspired by the spirit of the City of Grand Rapids, the region, and its connection to West Michigan’s “third coast” with the use of water-inspired terrazzo patterns, curved wood ceilings, terra cotta, and locally manufactured modern furniture. This project was completed in association with Tower Pinkster Architects & Engineers. Phase 1 of the Gateway Transformation was awarded Commercial Airport 2018 Project of the Year by the Great Lakes Chapter of the AAAE.